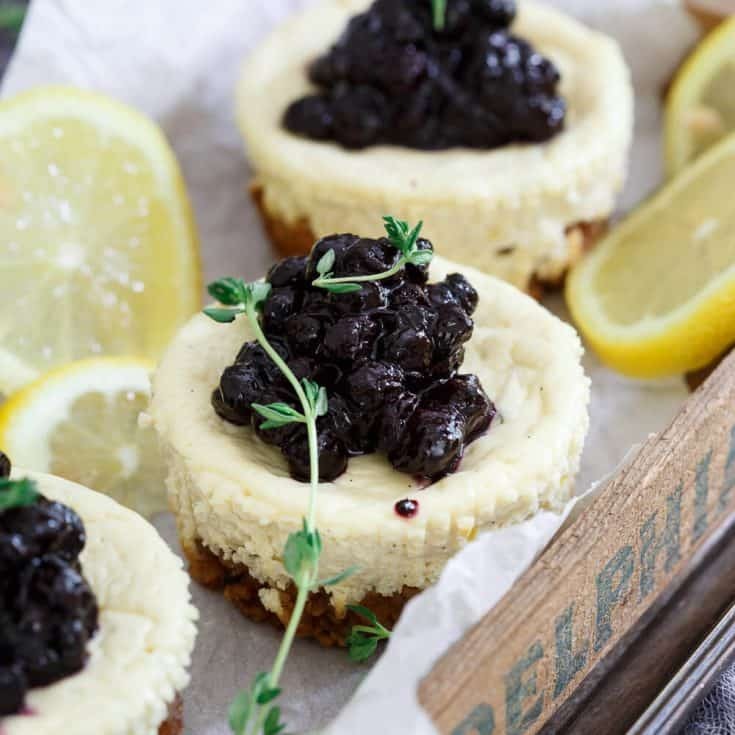 These gluten free granola crust mini cheesecakes are infused with lemon and thyme and topped with a quick blueberry thyme compote. When you think New York and you think food, what is it known for? A few things come to mind, apples obviously (boring), bagels (nothing compares to a NY bagel, that’s for sure), pizza (unless you’re from CT and want to argue about CT/New Haven pizza being the original/better than NY pizza – you’re wrong btw on that) and last but not least, cheesecake. This is where I become a bad New Yorker, I gotta admit, I’m not a huge fan of NY style cheesecake. Put a ricotta filled Italian style cheesecake in front of me and that’s a whole different story (way more my style). It’s not that I dislike NY cheesecake, it’s just that it’s too much. Like 3 forkfuls and I’m done. Between the eggs, the copious amounts of cream cheese and sour cream, it sits like a brick in my stomach. But a couple of weeks ago, I was in the city with Ulysses for a work dinner of his and a dessert platter that included cheesecake came out. A huge slice of the famous NY cheesecake took center stage on the plate so of course, I had to (even if somewhat reluctantly) scoop some up and put it on my plate to try. I assumed one large spoonful of the cheesecake would be plenty due to our history but as soon as that spoon hit my mouth and I tasted the light and fluffy rendition the restaurant had made, I was sold. I don’t really know what they did differently than most places, but I knew I wanted to recreate the light, airy filling at home because that’s a cheesecake I can get behind. Making mini cheesecakes was a given. Who has time for springform pans and dream crushing cracks down the middle of your cake? Yeah, ain’t no need for that kind of pressure in life. Muffin tins work just as well and then they’re already perfectly portioned! No brainer. Using neufchâtel cheese (basically low fat cream cheese) and Greek yogurt, the filling in these cakes is light and airy. 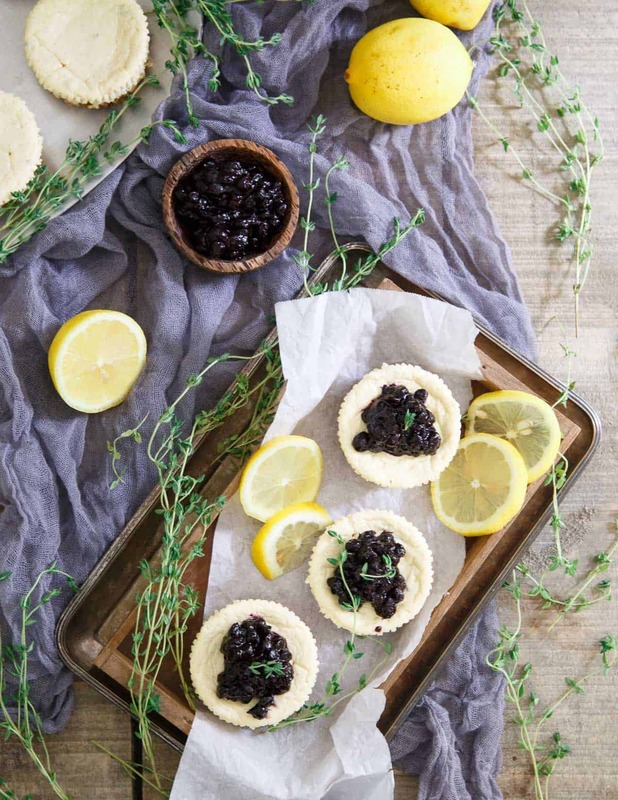 The lemon and thyme infusion brightens it up even more and adds a pop of freshness in each bite. 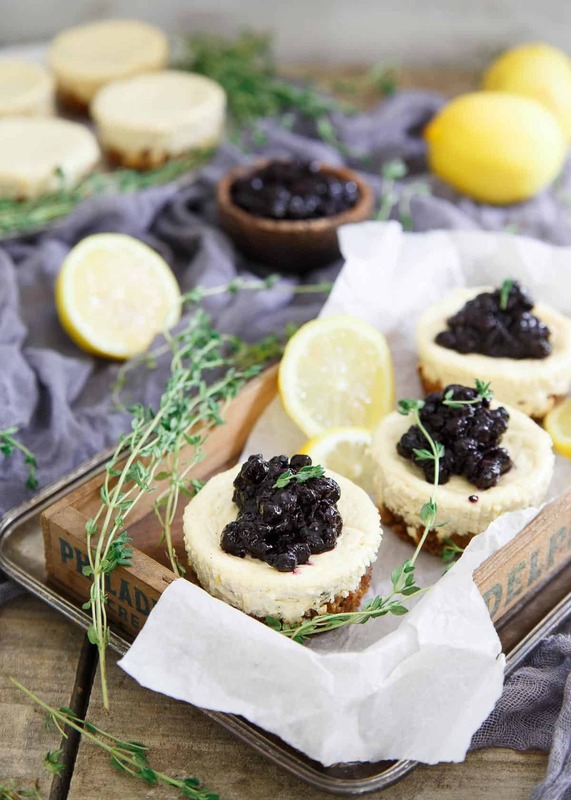 There’s thyme in the blueberry compote topping too bringing the flavors all together and instead of the typical graham cracker crust, these lemon thyme blueberry mini cheesecakes have a gluten free granola crust thanks to Udi’s original granola. New York, take note, your cheesecake needs some adjustments. Preheat oven to 350 degrees. Line a muffin tin with 9 baking wrappers. Combine all ingredients for the crust in a food processor. Pulse a few times until sticky and combined. Evenly divide the granola mixture among the 9 wrappers in the muffin tin and press down firmly using the bottom of a measuring cup or spoon. Set aside. Beat the neufchatel cheese and Greek yogurt in a medium bowl with a handheld mixer until fluffy. Add the remaining ingredients and beat again until well incorporated. Pour the filling on top of the granola crusts in the muffin tin. Bake for about 25 minutes until middle of the cheesecakes are set. Remove from oven and let cool completely on a wire rack before removing from baking wrappers. While cheesecakes cool, make the blueberry topping by placing all the ingredients in a small sauce pot over medium-low heat. Bring to a simmer, stirring occasionally and cook until reduced and thickened, about 15 minutes. Spoon the blueberry compote on top of each cheesecake before serving. I have the same problem with rating regular cheesecake. Too much lactose! Greek yogurt has much less so I bet I could tolerate this. Love all the flavors! I love how you made the crust for these cheesecakes. And you know how much I love the blueberry thyme combo!! So very pretty. Personal cheesecakes are one of my favorite desserts. Love the addition of thyme! I LOVE me some NY cheesecake, but like you said, it’s usually too heavy! I love that these mini ones are made with greek yogurt and are single serving sized! 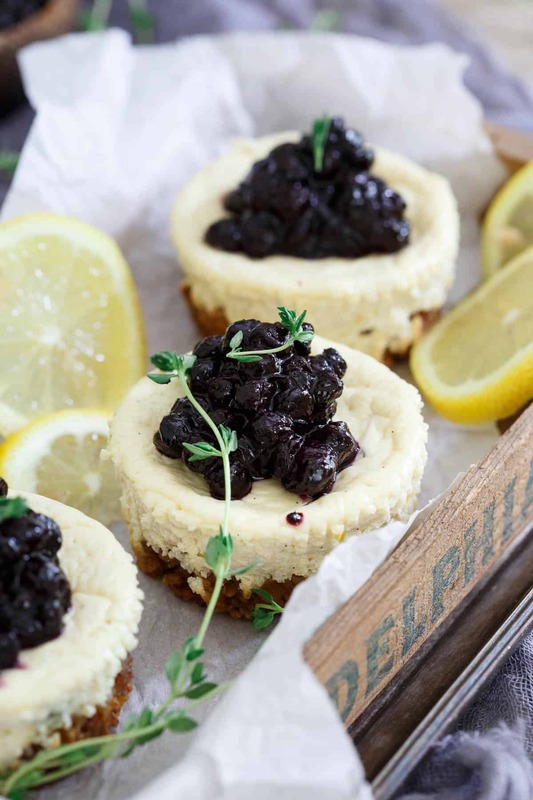 I simply adore that granola coocnut oil crust – these lemon vanilla cheesecakes with blueberry thyme compote are simply perfect – bursting with flavor and oh so cute! Gorgeous photos and these cheesecakes sound like an amazing flavor combination! Ok seriously – these are so beautiful I can’t handle it!!! Love the lemon thyme combo!! These look gorgeous. I would kill for a couple of these right now! These look so yummy! I was actually never a fan of cheesecake until I tried a vegan take on it, and then I fell in love! Now I can’t get enough of them! There is NO COMPARISON ~ fluffy ricotta cheesecakes are the best. I love the combo of lemon and berries, too! I would love to make these for Father’s Day but my mom has problems with Greek yogurt. Do you know a good substitute in this recipe? That’s a tough substitute as it’s the bulk of the filling. You could try a more traditional cream cheese/sour cream cheesecake mixture but you’d have to play with the ratios and I haven’t tested that out to give you any specifics. If she can do other yogurts and just not Greek yogurt specifically, plain regular yogurt would probably be your best bet. Or, even ricotta would probably work well. You’re wonderful. Thank you! I’ll try sour cream and maybe a bit of ricotta (or maybe plain yogurt… I’ll get creative.) Thanks for the help and for the recipe! I made these over the weekend and OMG that flavor combo is incredible! Thanks so much for sharing the recipe! 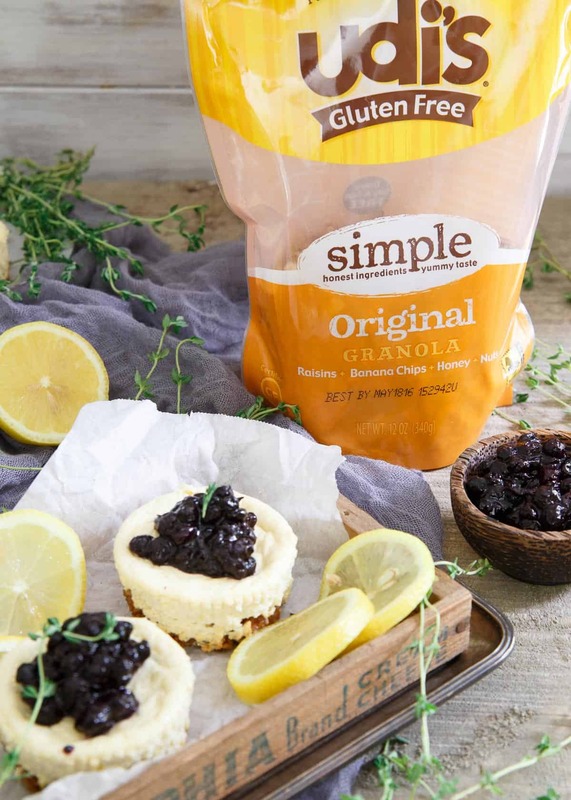 I love the use of granola for the crust of your cheesecakes. That means you can eat these for breakfast, right?! !